On 9 February 2017, the Burma Initiative of the Stiftung Asienhaus in cooperation with BICC invited the interested public to discuss hopes and disappointments in efforts to finding a solution to the decade-long displacement in Myanmar (in German). Refugee camp in Bahmo district, South Kachin state. Photo: BICC \ M. Rudolf. 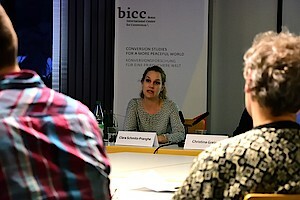 The coordinator of the Burma Initiative of the Stiftung Asienhaus in Cologne, Christina Grein, presented an overview over the state-of-the-art of the current reform- and peace process in Myanmar. 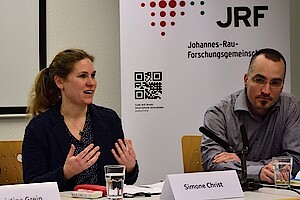 Clara Schmitz-Pranghe, researcher at BICC, and Dr Markus Rudolf, leader of the research project "Protected rather than protracted—Strengthening refugees and peace" funded by the German Federal Ministry for Economic Cooperation and Development (BMZ), presented the situation of internally displaced people in Myanmar and Thailand. In the ensuing discussion, the three panellists first tackled the challenges and perspectives of return and local integration against the background of current political and economic developments and then opened the floor for questions and the exchange of ideas. After that, talks continued during a more informal drinks get-together. Simone Christ (BICC) moderated the event. 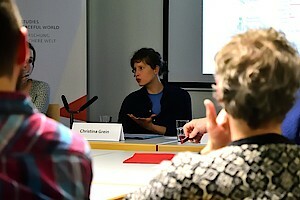 Christina Grein (m.) gave an overview of the current reform- and peace process in Myanmar. 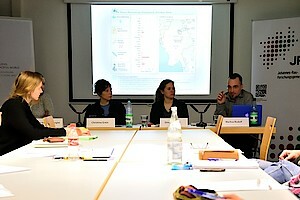 Markus Rudolf (r.) presented the situation of IDP's in Myanmar. Clara Schmitz-Pranghe (m.) presented the situation of IDP's in Thailand.